Irish Leather by Memo is a Leather fragrance for women and men. Irish Leather was launched in 2013. The nose behind this fragrance is Alienor Massenet. 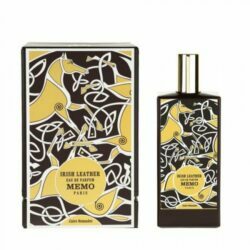 The fragrance features juniper berries, amber, leather, mate and tonka bean.Irish Leather by Memo is a Leather fragrance for women and men. Irish Leather was launched in 2013. The nose behind this fragrance is Alienor Massenet. The fragrance features juniper berries, amber, leather, mate and tonka bean.